The Arkansas eviction notice forms may be used in the event that a tenant fails to pay rent or otherwise violates the terms of the lease. The forms explain the reasons for eviction and the conditions under which the tenant needs to leave the property. When a tenant remains on the property after violating the lease terms, it’s called an “Unlawful Detainer”. Under the Arkansas Landlord Tenant Act of 2007, a landlord, after giving proper notice, may have the tenant evicted by filing a Cover Sheet, Summons, Complaint and Notice of Intent to issue a Writ of Possession with the circuit court with a fee of $165.00. The defendant will have to be served by a process server and they will have 5 days to file and pay the rent owed. If a tenant fails to do either of these steps, the court may issue a writ of possession, whereby the tenant will be barred from entering the premises. 3-Day Notice to Quit (Non-Payment of Rent) – This is the notice that may be served if a tenant fails to pay his or her rent within five days of the date that it is due. 14-Day Notice to Quit (Non-Compliance) – In the event that the tenant breaches other provisions of the lease, not related to the payment of rent, such as having other people stay in the premises or having a forbidden pet, a landlord may serve this notice. 30-Day Notice to Quit (Month to Month) – This notice is for terminations of leases in the normal course of business, for instance when the lease is a month-to-month lease, or when the term is up and the landlord does not intend to renew the lease. 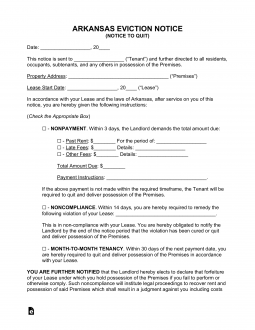 Rent is due within 5 days of the due date, otherwise, the Landlord may terminate the lease agreement (§ 18-17-701). Step 1 – If a tenant is not in compliance with the terms of the lease, you must serve the tenant with a notice to quit. If they fail to pay rent within 5 days of the date the rent is due, you may serve a 3-Day Notice to Quit (Non-Payment of Rent). For other breaches, you may serve a 14-Day Notice to Quit (Non-Compliance) and to inform the tenant of the termination of the lease in the normal course of business, you may serve a 30-Day Notice to Quit (Month to Month). Notice of intent to issue a writ of possession. Step 3 – The landlord then must obtain the services of a process server to serve the documents on the tenant. Step 4 – The tenant has 5 days to pay the owed rent and to file an answer with the court. If the tenant fails to do either of these requirements, the court may issue a write of possession which will give possession of the premises back to the landlord and the tenant will be barred from accessing the premises. Step 5 – A landlord may then go after the tenant for damages including unpaid rent, cleaning costs, court costs and other damages. Obtain a copy of the Lease, then on the first blank line enter the Name of the Recipient precisely as it is reported on Lease. You will also need to individually identify the City, County, and Zip Code of the premises (in that order) using the first three blank lines in this paragraph. Use the last two blank lines of this paragraph to identify first the Building Number and Street then, the Apartment or Unit Number of the premises. All of this information must be reported as it appears on the violated Lease Agreement. This introduction will be completed when you use the blank spaces following the words “…signed on the” to report the Signature Date on the Lease. The result of the Tenant’s Violation will be determined by one of the choices in this section. You must choose one of the checkboxes then enter some additional information regarding the situation. Month-to-Month Tenancy will be handled in the next section. If the Tenant has five days to pay a specific amount of past due money to remedy this situation, then place a mark in the first checkbox. Then on the first blank line, name and Agent of the Landlord that may accept such a payment. Next, define the Total Amount Owed using the blank lines on either side of the word “Dollars.” On the last line of this choice, report the Amount Due on the first blank space then the time period this Overdue Sum applies to using the last four blank spaces (month/year). If the Tenant will be given fourteen days to correct the Lease Violation, provided he/she/they take certain actions then, mark the second checkbox. Define what actions the Tenant must take to correct the violation and remain on the premises (if successful) using the blank line provided. If the Landlord is issuing this Notice, he or she must check the first box then enter the Day the Lease will terminate. This must allow for thirty days of receipt to pass. If the Tenant is issuing this Notice, then check the second box. The Tenant must also list the Termination Date of the Lease and it must allow at least thirty days to pass from the receipt. The Agent delivering this Notice to its intended recipient will need to complete this paperwork to verify it has been delivered appropriately and legally. The Agent will need to enter the Date, Month, and Year this document was served on the first three blank lines. Then on the line after the word “to,” must report the Name of the Recipient. Finally, he or she will need to indicate how this document was served. If it was served to the intended recipient firsthand then the first checkbox must be marked. If it was delivered to a household member or a co-worker (at the recipient’s place of employment) that is of legal age and who will reliably deliver the document, the second checkbox must be marked. If this document has been mailed using First Class Mail directly to the intended recipient, the third checkbox must be marked. The Agent will need to Sign his or her Name, on the Signature line, to verify this section as being true.